When patients are struggling with issues like acne scars, dark spots on the skin, or wrinkles, American Skin Institute providers can use the Venus Viva device for fast treatments with minimal downtime. This device relies on radiofrequency waves to heat up deeper skin layers, which stimulates the growth of collagen fibers and healthy skin cells. 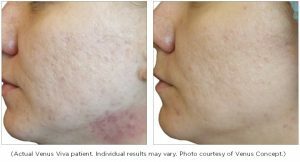 Through several quick, and virtually painless, treatments our providers can use Venus Viva to help patients achieve tighter skin, with reduced visibility of textural and hyperpigmentation issues. To schedule your Venus Viva consultation, please call an American Skin Institute practice near you, or email us through the Contact Form. The basic concept behind Venus Viva skin treatment is to heat up deeper skin layers and cause small amounts of targeted damage. This micro damage is achieved through radio frequency waves and stimulates the body’s natural repair processes, which leads to a stronger collagen support network and the growth of new skin cells. As the body repairs itself, the patient will notice smoother skin texture and reduction of dark spots. To reduce recovery time, Venus Viva relies on a fractionalized approach which delivers the radio frequency waves in separate columns that only treat a portion of the area. By leaving more of the tissue untouched, the body is able to heal faster, which eliminates the need to take time off work. Is Venus Viva the Same as Laser Skin Resurfacing? No, Venus Viva does not rely on laser technology, but instead utilizes radio frequency waves. This allows your American Skin Institute provider to deliver the energy deeper into the skin, while leaving the surrounding tissues virtually untouched. Further, with laser skin resurfacing, the cells near the skin’s surface are often destroyed in an effort to address previous skin damage. However, the process can cause prolonged down time, as well as side effects like peeling and crusting of the skin. 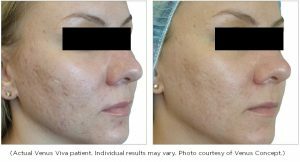 This is not the case with Venus Viva, which focuses on deeper skin layers and does not cause the oozing or crusting associated with laser resurfacing. Venus Viva treatments are safe when performed properly, and the device has been cleared by the FDA for skin treatments. Most patients will experience mild redness for several days after treatment, as the body’s immune system is repairing the micro damage caused the radiofrequency bursts. However, most patients do not need to take time off and often perform this treatment during their lunch break. You will be able to apply makeup to the area the next day. Further, Venus Viva does is safe for all skin types. When you visit American Skin Institute for your Venus Viva treatment, one of our providers will carefully assess your skin and will listen to all of your concerns and goals. Based on this consultation, your provider will create a customized treatment plan for you and help you understand the possible results that may be achieved in your unique situation. To ensure that you are comfortable during the procedure, your American Skin Institute provider will use a topical anesthetic. Most patients handle the treatment very well, and any discomfort is minimal. Your provider will then use a special applicator hand piece to deliver the radiofrequency bursts to the treatment area. After the Venus Viva treatment is complete, most patients are able to continue with their daily routine. In many cases, the treatment can be as short as 15 minutes. To see if Venus Viva is the right choice for you, please schedule an appointment at an American Skin Institute practice near you, or email us through the Contact Form!